As far as we’re concerned, home integration professionals have one of the toughest (and most exciting!) jobs out there. These folks don’t rest for a nanosecond; they’re constantly researching, traveling to shows, symposiums and conventions and meeting with vendors to ensure that they’re ready with the technologies when we are. We have nothing but respect for these professionals who are always light years ahead of the rest of us, even in their warp-speed world. 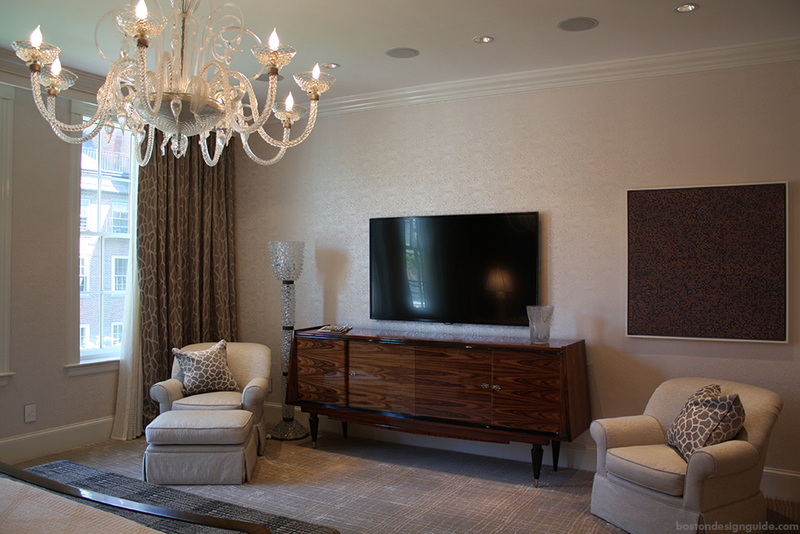 We queried the minds at three in-the-know companies to see what’s up and coming in custom home integration and AV. Dave Shore, owner of AudioART; Sarah and Don Cavicchi of Cavicchi Audio Video; and Founder Brian Gibson and Marketing and Client Relations manager Olivia Gibson of Elite Media Solutions (newly awarded Consumer Technology Association’s prestigious 2017 Integrator of the Year!) were happy to divulge what they see as the top five AV and home integration trends of 2017. 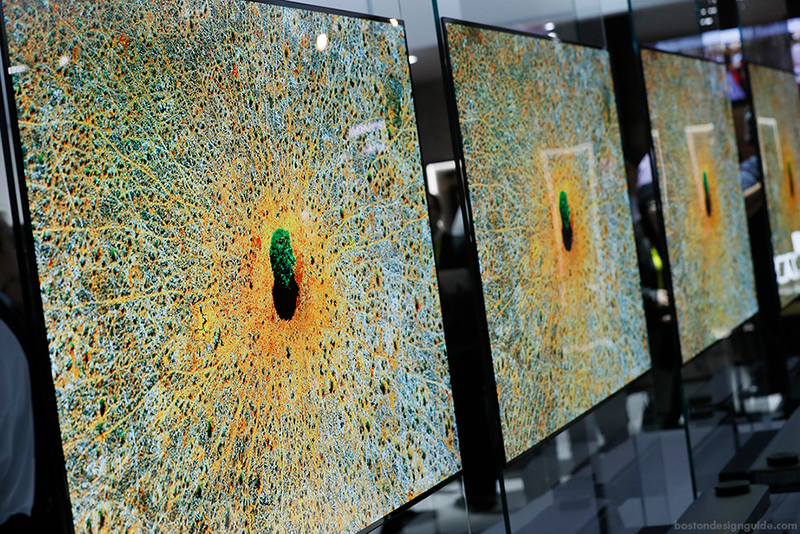 OLED (organic light-emitting diode) TVs are only getting better and brighter. Sony is poised to have an exciting year, says Elite Media Solutions’ Brian Gibson, and is unveiling an unbelievable lineup. Wildly immersive, OLED TVs “have deep blacks and bright whites” that can be viewed well from any angle, not just straight on, he explains. The video clip below of an A1E OLED 4K Ultra HD High Dynamic Range Smart TV shows you just what he means. One word of caution. While picture quality is getting more and more dynamic, sound quality is suffering, so you’ll want to pair some type of system with it to have great sound, contends Gibson. Enter Dolby Atmos’ “height channels” (that’s an amped-up name for extra speakers that go right into your ceiling); they’re a huge advancement in surround sound. 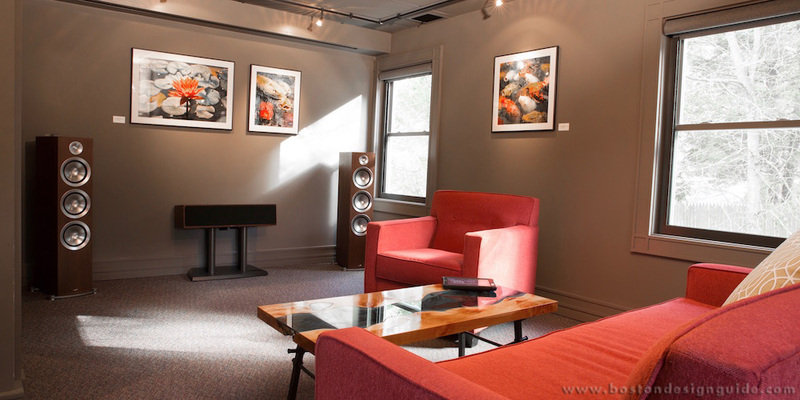 “If you’re watching a movie, and it’s pouring rain,” maintains Gibson, “it feels like it’s coming right down on you.” Elite Media Solutions has added Atmos to their showroom for those looking to test-drive the heightened sensory experience. TVs are also getting thinner and more elegant with every passing day. 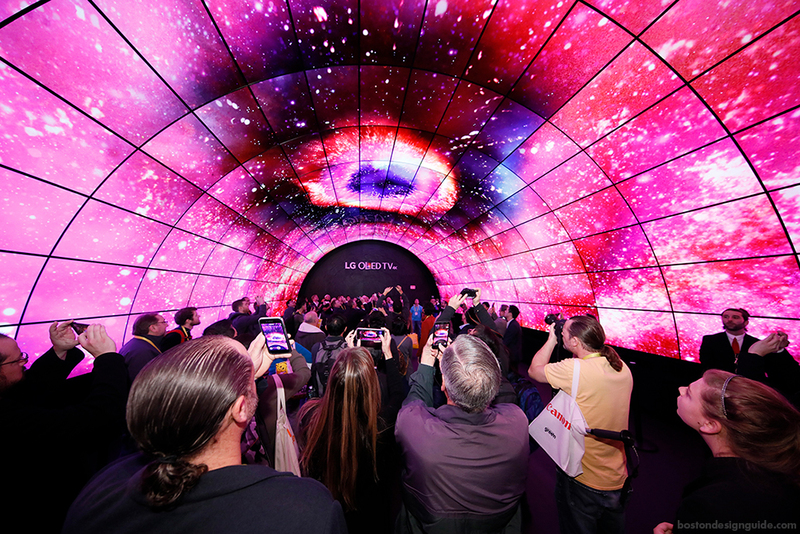 In fact, LG is showing an OLED that’s so thin it was held to the wall by magnets,” he says. Sarah Cavicchi concurs, adding that it’s not just the TVs themselves, it’s how they’re mounted. People are seeking an ultra clean look; it goes beyond seeing wires, they don’t want to see any protrusion at all. 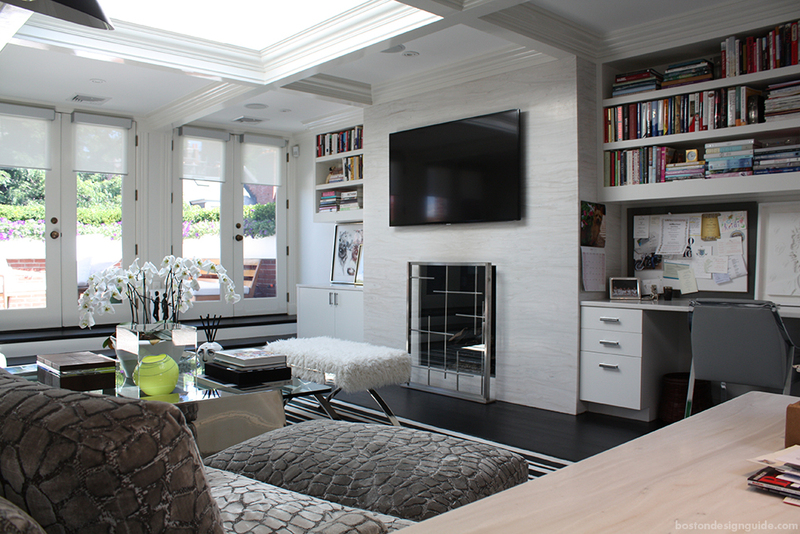 Clients of Cavicchi Audio Video want in-wall recess mounting for their super-thin TVs. Some installs literally look “like a piece of paper on the wall,” describes Cavicchi. As complicated as home integration may seem, its goal is to simplify our lives (how’s that for irony?). The trend toward integrating and accessing all of your systems—sound, temperature, lighting, window shades, surveillance, doorbells—from your smartphone, iPad or Apple Watch that has been all the rage for the last two years is only gaining speed. Homeowners with smart homes can create and save preferred experiences or “scenes” and launch them with a touch of a button. This can be done whether your home is one or 100 years old. For example, Sarah Cavicchi has a “Welcome Home” setting on her iWatch for the end of her workday. When she hits that button, the outdoor landscape lighting switches on, a door unlocks and the lights in her entry hall shine. “She walks in to a lit up house,” says Don Cavicchi, “and feels more safe and secure.” It can also lower automated blinds and cue her favorite song. The technology is perfect for second homes and energy efficiency. You can set your vacation home to an “away” setting to keep the thermostat at the temperature you’d like and then signal that you’re “arriving” to turn on the A/C. Surveillance cameras allow you to keep an eye on your property from a distance, saving you the trek, and ensure that your home is protected and free from surprises (i.e. no pipes have broken). The Cavicchis feel that the technology will only get smarter and start to recognize our trends and tendencies. It may even offer suggestions, says Sarah, such as notifying you when freezing temps are projected so you can turn up the heat in your summer home or if you’d like to lower the shades a little later in the day because the days are getting longer. Until then, this one-device technology isn’t new, but the marketing around it is, maintains Elite Media Solutions’ Olivia Gibson. These days it’s the lifestyle that’s being sold, and the simplicity and peace of mind a one-source system brings. Elite Media Solutions shared a video link below featuring a Control4 system that shows the “whole house going to sleep.” It’s worth a thousand words…. Probably the biggest new thing in his industry, says Brian Gibson, is voice control, and the advent of Amazon Echo: Alexa and competitor Google Home. Initially, Gibson wasn’t sold that the idea would catch on—he wondered if people really wanted to speak to their devices—but it has… like wildfire. Now, if Alexa is tied to your control system, he maintains, you can say, “Alexa, launch the goodnight scene,” and the house will lock its doors, shut off the lights, etc. For Google Home, all of the new Sony TVs have the Google operating system built into all of their smart features, including YouTube and Netflix, Gibson explains. For example, you can walk into the room and tell Google to play Star Wars: the Force Awakens and your TV will turn on, go to Netflix, and the movie will start. You won’t have to do anything, except maybe pop some popcorn, well, at least until next year’s trend report. TiVo Bolt is all on one platform, so you can see your cable guide, Netflix, Hulu, Amazon Prime and Apple TV through your cable box. “You don’t ever have to leave that platform” says Don, and “it’s all integrated with your smart device.” TiVo Bolt allows viewers to download recorded shows and watch them on your iPad or computer, and search across their multiple accounts to find a show or movie. How many times have you bought a movie that you could have viewed for free through your Netflix or Amazon Prime subscription? That’s a great capability, to be sure, but the one that stands out to most people? “It has a button that skips commercials,” adds Don. These days everyone wants to be connected. No one wants to be slowed down or—worse yet—knocked offline, yet all of our devices, cordless phones, microwaves and even refrigerators are taking a toll on our systems. Fret not, “almost any house can be brought up to speed,” says Shore, “with the addition of a high-speed router/switch and strategically located wireless access points (WAPs). Hard-wired WAPs perform better than wireless extender systems and can be easy or difficult to install given the age and infrastructure of one’s home, he says. No matter, AudioART can get creative with wiring paths making high performance AV available to everyone. “Streaming devices like Smart TVs, Apple TVs, Roku, Blu-ray DVDs and video games will perform at a higher level of reliability if they’re hardwired,” he reveals. In case of a power outage, which is pretty much a foregone conclusion during winters in New England, Shore suggests locating a battery backup power supply (UPS) on your network components to keep your network humming. “In conjunction with a switch that has power over Ethernet, the modem, router, switch and the wireless access points will remain active.” If your laptop isn’t charged, it too can be plugged into the UPS. Unless, of course, you’d rather play Monopoly.